The extra virgin olive oil market and the excellent properties of this product are still unknown by most people. 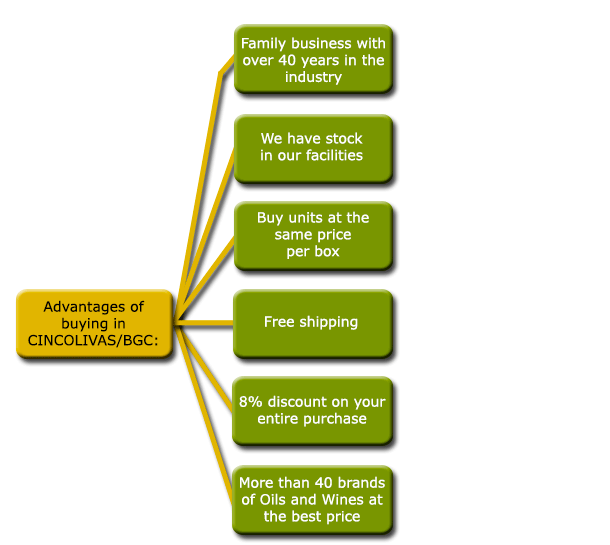 Cincolivas aims not only the direct sale of products to end customers but also the knowledge of them go extending every day a little more. If you are reading this section, you probably have some Business catering, gourmet shop, Distribution business ... WE CAN HELP YOU! because we offer you the Best Spanish extra virgin olive oils of all varieties and formats, adapted for you with the best prices. You can choose the brands and quantities you want for each of the oils, it is not necessary to purchase a minimum quantity of a particular product. Remember to enter the "Coupon Code" section of your order the word MAYORISTA, which lets you 8% DISCOUNT on your purchase. If you make payment by Bank Transfer you will benefit from an additional discount of 2%. Take advantage of FREE Postage, from 450 euros of purchase. (See deliveries to certain areas in Europe). - Send us your inquiries: Info@cincolivas.com.